"I still govern Eschnapur, priest." From his expressionist masterpieces Dr. Mabuse The Gambler, Metropolis to M and beyond, Fritz Lang has made an indelible mark on world cinema. When The Indian Tomb was offered up for review, I grabbed for it. 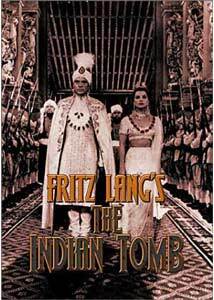 Unfortunately, The Indian Tomb has only a slight hint of Lang's genius—all in the visuals. The quality film's aesthetic is undefortunately mired in an atrocious story. Beginning with a recap of The Tiger of Eschnapur, The Indian Tomb starts with Harald's sister, Irene (Sabine Bethmann), and his brother-in-law, Walter (Claus Holm) arriving in Eschnapur. Chandra has hired Walter to build a giant tomb for Seetha (Debra Paget), who ran off with Harald (Paul Hubschmid) in the previous film. Chandra's men recapture Paul and Seetha, and Chandra tries to persuade Seetha to love him. Meanwhile, priests want Seetha dead for betraying their temple, and Chandra's brother plots to overthrow him. If that sounds bad, just imagine trying to watch it. Gone are the human characters of Lang's earlier films, now replaced with one-dimensional caricatures that are caught in utterly banal and silly situations. The vitality that usually permeates Lang's films is conspicuously absent here, and the whole project is worse off because of it. The only thing that makes the film worthwhile at all is Lang's visual style, which is still in full force here. Shots of men on elephants, wide open Indian vistas, underground caves, tiger cages, giant temples, and more make the film a visual feast. The set pieces are stunning, as well as is Lang's sense of framing. I wonder if watching this film on mute might have made it better. Perhaps the worst thing about the film is the lack of logic. For example, a man is whipped repeatedly in the face, and neither does he flinch nor is his skin broken. There are so many illogical events that it would take too long to list them here, but the effect is a complete inability to suspend disbelief—even for the causal viewer. Also, the "special effects" are some of the worst I've seen, even for a film of this age. There is a sequence where Seetha dances in front of a cobra, and the cobra looks just as bad as the tiger in the first installment. You can see the wire holding it up half the time, and the other half it shakes so much that it's obvious that is isn't a real snake. Why did Lang even bother? Interestingly, about 01h:20m into the film, there is a sequence that is on par with anything Fritz Lang ever did. I won't go into detail and ruin it, but let's just say that it's simultaneously indicative of Metropolis, while looking forward to the look of Night of the Living Dead. The sequence comes seemingly out of nowhere, and it shocked me out of the stupor that the rest of the film had put me in. While I can't say it's worth purchasing the whole film for this one sequence, it is certainly worth seeing, especially if you're a Lang fan. As, despite my rampage here, I am. Image Transfer Review: Shown in its original theatrical aspect ratio of 1.33:1, this transfer of The Indian Tomb is particularly vexing. Certain scenes look as pristine as anything from 1959 can, while others look like they've been left out in the sun for five years. The worst are cross-fades. Every time one occurred, the picture quality dropped significantly. Audio Transfer Review: The mono mix sounds thin and cramped. There is a particular scene in which people are throwing swords into a big pile where the sound is so tinny I actually winced. The score is very low, and the whole thing suffers from a lack of aural detail. Extras Review: Just a photo gallery, actually filled with some interesting behind-the-scenes pictures. Highly disappointing. The Indian Tomb is a sad near-end to a master filmmaker's career. Skip it.